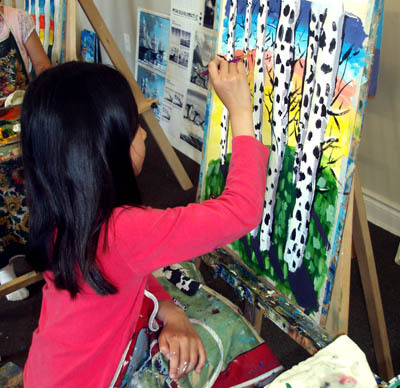 We use acrylic paint in many of our art programs due to its extremely versatile qualities. Acrylics comes in great number of colors and shades. It is fast-drying paint, and can be used straight from the tube like oils or thinned with water to used like watercolors. Acrylic painting is very popular with kids since they can experiment with different brushstrokes, colors and styles. In addition acrylics give students the “feel” of oil painting with the water-washable ease and non-toxic safety of child-safe paints. Another good thing about acrylic is that it ranges from a very thin, ink-like consistency able to be used in airbrushes through various degrees of ‘flow’ to the consistency of soft cream cheese. This allows really heavy 3D (impasto, or paste) effects. We add different substances to the paint to create all sorts of textures. Also plaster and sand can be used to achieve a variety of textured effects. Featured painting: Our student Maggie used acrylic for her composition Birches. She used thin layers of paint one on top of another to show light and dark when painting Birches combined with colourful background. Maggie is 7 years old; she started to attend art lessons last year and is very comfortable now using acrylic in her art assignments. Good job! that looks awesome little girl!